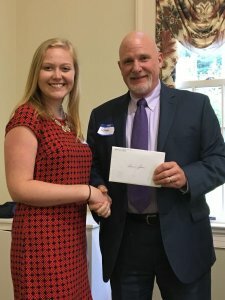 Every spring, the Richmond Association grants scholarship awards to a graduating senior from a Richmond-area high school. Our criteria emphasize academic excellence, well-roundedness, thought-leadership, character, and the quality of a written essay on the value of a liberal arts education to the individual and society. Selection is always difficult because of the exceptional quality and number of seniors who submit applications. Sierra R. Spain graduated from Varina High School in 2017 with a GPA of 3.99. She showed herself so talented both in the sciences and in communications in High School that upon graduation she found herself in a quandary about which university to choose: the University of Virginia or Virginia Tech. When she appeared to accept her PBK scholarship in June at the University of Richmond, she had decided to attend Virginia Tech, but was uncertain about whether she wanted to be a communications specialist or a physician. She is well qualified to pursue whichever field she chooses. In addition to working two jobs in high school, Sierra challenged herself with the most rigorous courses in her school, and while engaging in multiple extra-curricular activities, and serving as captain of the cheerleading squad. Noah Slate graduated from Thomas Dale High School in 2017 with a weighted GPA of 4.61. Noah has aspired to be the consummate musician his entire life. He progressed from piano, to trumpet and settled on the French Horn as his primary instrument in his multi-faceted musical endeavors. From the school’s marching band, show band, wind ensemble, and pit orchestra at Thomas Dale, he has participated in the Richmond Youth Wind Ensemble and the Richmond Symphony Youth Orchestra during his high school career. While he has become a dedicated tutor of students with their musical arrangements and in learning how to play piano, he was also the recipient of the Thomas Dale High School Principal’s overall Scholar Award in 2014. He plans to pursue music composition for film and television and other visual media at the Berklee College of Music, although he will spend his first year by studying music in Valencia Spain. 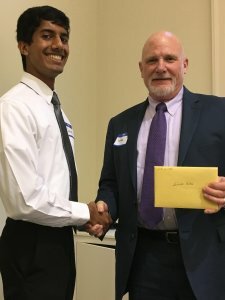 Samarth Kishor graduated from Maggie L. Walker Governor’s School in 2017 with a weighted GPA of 4.32. Samarth showed himself to be among the most uniquely gifted of the students to have attended the Governor’s School. While he has accomplished much in his area of major interest: computer science, he epitomized the Phi Beta Kappa motto “love of learning is the guide of life” in every aspect of his broad curriculum at Maggie Walker. Not only did he engage in learning Spanish and Japanese, and receiving awards in both languages, he also was an accomplished saxophone player and teacher. He also has a strong commitment to community improvement. He spent many hours volunteering in the Spanish speaking community helping non-English speaking adults with GED preparation. Daniel J. Kovach graduated from The Steward School in 2016 with a weighted GPA of 5.1. Aside from his high scholastic achievement, he became an outstanding actor in school productions, was a standout swimmer on the school’s team, and was active in student government. 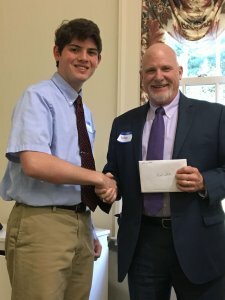 In addition to winning the Jefferson Book Award from the University of Virginia and several science awards, Daniel showed considerable talent for languages. He won the school’s Latin award, and studied and gained fluency in Italian and Spanish. In addition to an innate desire to learn languages in order to communicate internationally, he intends to use his intense interest in science in his goal to become a physician. Thomas J. (“TJ”) Krivanec graduated from Open High School in 2016 with a GPA between 3.5-4.0. His distinctive interest in the arts was evident in his study of all art forms. He became especially adept in the both pictoral art and music while excelling in all other high school subjects. While engaging in a challenging academic schedule, he also held several jobs during high school. He was accepted early in the Art Foundation program at Virginia Commonwealth University, and will use his scholarship toward his studies there. After only three years of high school, Amy Ariel was an August, 2016 graduate of Godwin High School. While in high school, she became heavily involved theater technology and lighting design involved with television and cinema. Not content with the technical aspects of drama, she also acted and was given the Outstanding Thespian award for her acting in productions at Godwin. Amy was not content with production and acting, so she immersed herself in Mathematics and Science in which she received awards. Finally, while engaged in her scholastic and work in the theater, she also was selected to attend the High Tech Academy pre-engineering program. She plans to pursue engineering as well as theater technology and lighting design at Virginia Commonwealth University. The Richmond Association of Phi Beta Kappa Scholarships are funded with private donations from our membership. Thank you to all who have donated generously. For information about giving to the fund, contact us. A special thank you to the members of the 2016 RA Scholarship Committee. For information about serving on the committee, contact us.